Location: Situated on the E side of the A487 in Bontnewydd, some 70m N of the bridge over the Afon Gwyrfai. Calvinistic Methodist chapel rebuilt in 1896, in unusual Baroque style with domed towered front. Ornate stone front on plain rendered two-storey chapel with slate roof and hipped rear gable. Front is of grey limestone laid in a chequered pattern of square blocks, separated by narrow rectangular blocks. Extensive sandstone ashlar moulded dressings. Facade is set back behind lean-to entry between twin towers with domed tops. Pediment with moulded coping, ball finial, flush lower band and keyed oval panel. First floor exuberant Baroque tripartite window; Palladian-type arched centre window with side lights set in an elaborate stone frame; centre full pedimented and pilastered aedicule reaching through into main front pediment and enclosing moulded arch and pilaster jambs of window itself, a long keystone linking arch and aedicule pediment; side lights are pilastered with corniced entablatures and massive triple keystones; heavy moulded sill course right across. Ground floor lean-to porch has 3-bay front, ashlar pedimental-gabled centrepiece, grey stone each side and ashlar parapet and pediment coping with 5 ball finials; centrepiece is rusticated ashlar with big arched doorway, double panelled doors and leaded fanlight; sides have arched single lights in moulded ashlar eared frames with double keystones. Side parapets have undulating roll-and-flat coping. Towers are three stage, first two square with channelled ashlar angles and arched window each floor. Moulded sill course to first floor and matching cornice above. 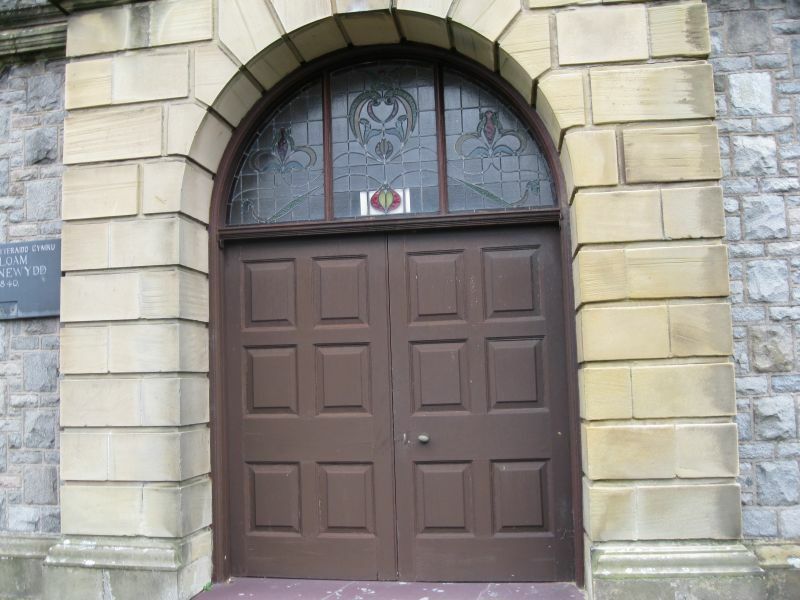 Windows have ashlar surrounds, flush rusticated with double key to ground floor, moulded, eared with double key above. Similar windows to tower outer faces, inner first floors have matching blank panel. Towers are capped with octagonal large cupolas; stone drums with keyed ovals in cardinal faces, and console feet on shorter diagonal faces, channelled angle pilasters and moulded cornice. Leaded shallow domes, flattened ogee profile with bell-cast top finials carrying balls. Side walls have 2-storey, 4-window elevation of small-paned sashes, 20-pane in plain ashlar surrounds. Lower windows have voussoired heads and keystones. Rear has two first floor sashes and large single-storey schoolroom, single-storey, 5-window, with 24-pane sashes to rear wall. Roof is hipped to N and canted hipped to S.
Fine interior with C18-style plaster panelled ceiling and modillion cornice. Three-sided curved-ended gallery, painted wood on 5 iron columns with florid brackets carrying gallery panelled underside. Gallery front is in long panels broken by square panelled piers; dentil cornice. Pine pews in 3 blocks, half-oval great seat with turned-baluster back. Pulpit on corniced panelled base with ornate panelled upper half, and large ball finials at angles; much varied graining, the centre broken forward with black ringed angle shafts. Behind pulpit is fine Renaissance-style aedicule; triple stepped blank arches with centre console key, all set in ornate Ionic frame with full entablature, festooned frieze and modillion cornice. Lobby to rear has double half-glazed doors each side and centre window all with patterned and coloured leaded lights. Gallery has steeply raked pews, curving to match gallery angles. Vestry has boarded 3-sided hipped roof and balustraded enclosure with benches and lectern at one end. A chapel of unusual architectural aspiration, with remarkable twin-towered facade of mixed Baroque derivation, and fine interior.